Lazies, Julie Herman of Jaybird Quilts has been taunting me on Instagram and Facebook with pics of candy wrapper Becca Bags. Well, no more! 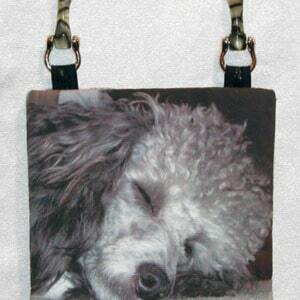 I’m going all t-shirt on you with a fantastic up-cycled Becca Bag that has a surprise ending. Pin this image to save the idea! 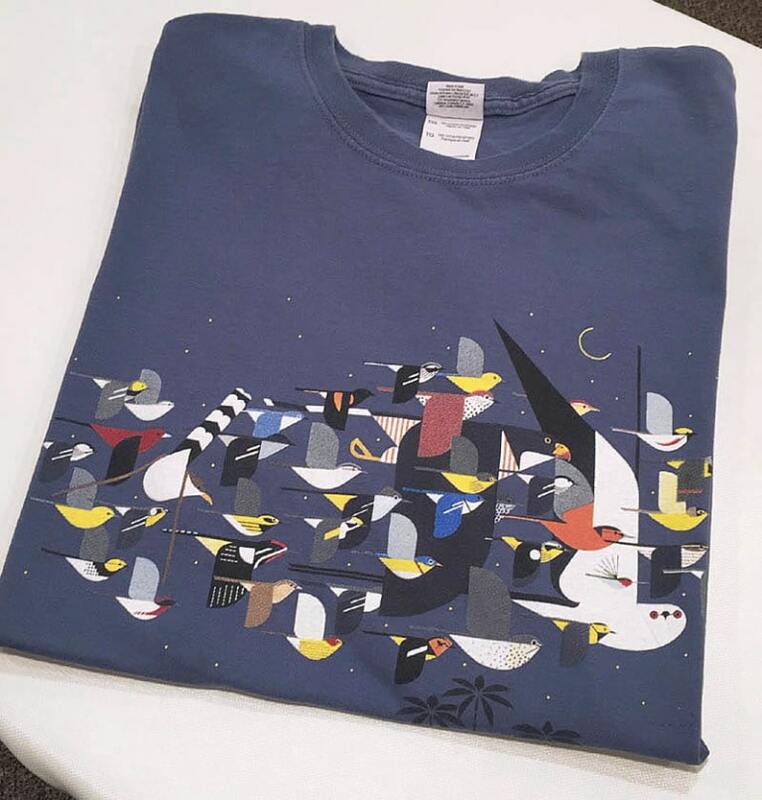 The design on this t-shirt is by artist Charley Harper. For our purposes, this is an all-over design, rather than an emblem or logo. The whole thing won’t fit on Becca, but I’m not too concerned about centering or cropping it for this project. It will be fun no matter where it lands. 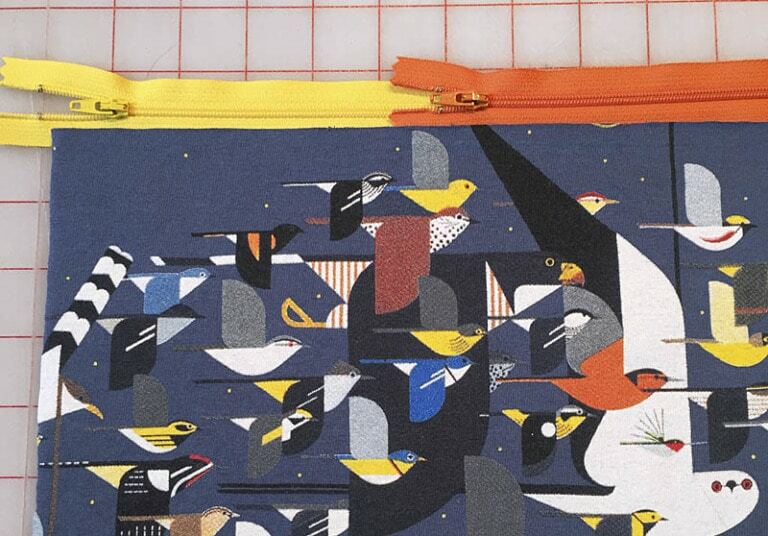 Instead of piecing fabrics to build the panel shown in white/orange/blue on the large Becca Bag from the pattern cover, I’ll simply cut panels the size needed for this project. 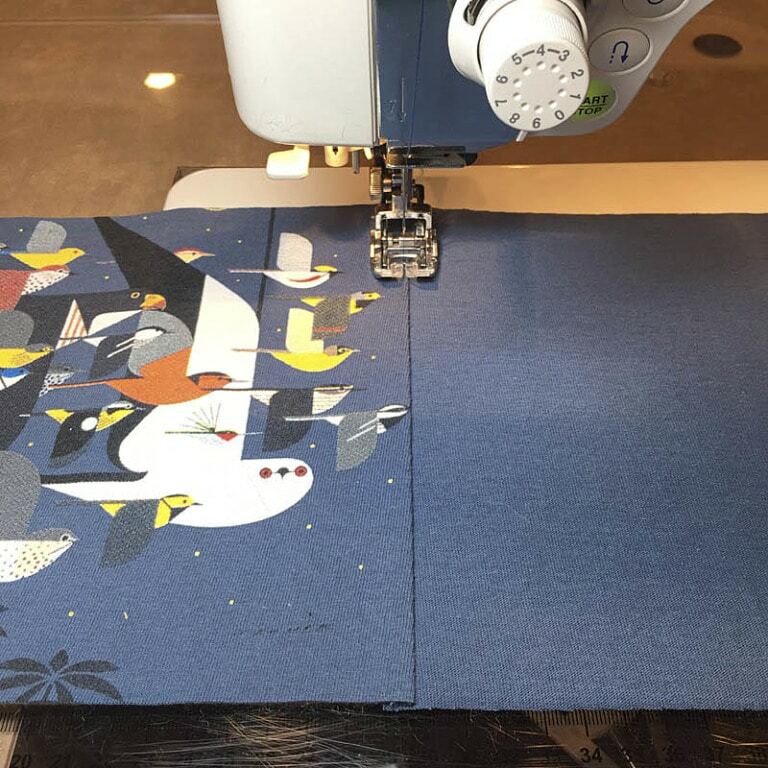 I cut my Dreamy Fusible Fleece for Becca as per the pattern and used it as my guide for positioning the artwork. I folded the fleece in half to represent one side of Becca. Remember some of this design will end up on the bottom and wrap around the bag at the ends. I decided to piece the artwork panel to a plain panel cut from the back of the t-shirt to make the fabric size needed. Right about now, many of you are talking to the screen telling me: ‘Use a lightweight fusible interfacing to stabilize that t-shirt’! 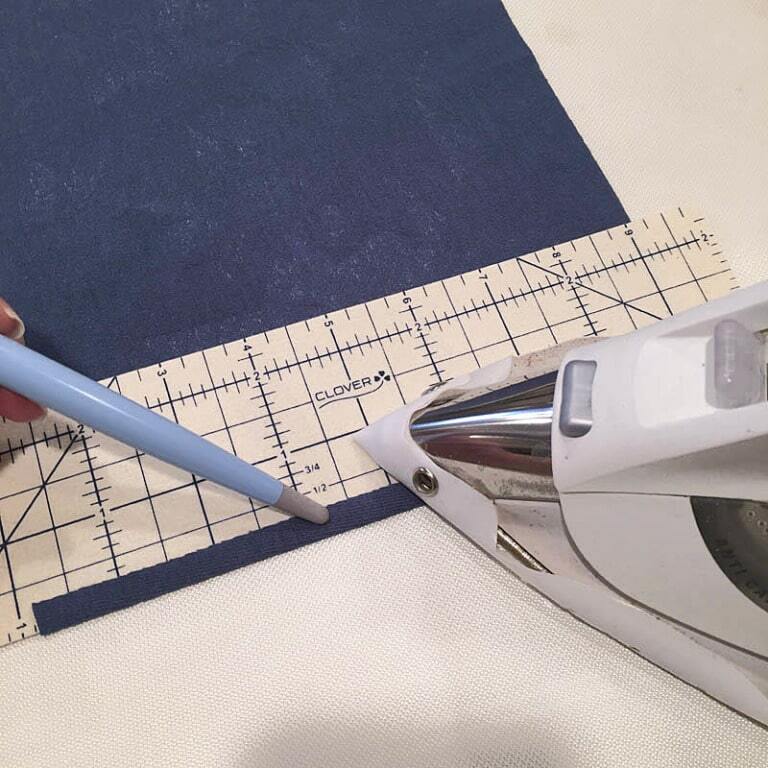 That’s standard procedure when making t-shirt quilts. – I thought the same thing. – But that’s not what I did. I like the softness of this t-shirt and I didn’t want to lose that feeling by adding more interfacing. I decided to fuse both panels directly to my Dreamy Fusible Fleece, then stitch them together where they overlap. I did a test-fuse and found the t-shirt fused beautifully to the fleece. But, here’s the exciting part – the fleece allowed the t-shirt to still feel soft like a t-shirt, but more hearty almost like a sweatshirt! Oh my gosh, I created a sweatshirt-like fabric from a t-shirt. It feels soft, but thicker, and has body similar to a sweatshirt. The combo isn’t stiff, yet this small bag still stands up nicely. I really liked the feel of these two together. This is a home run in my book. 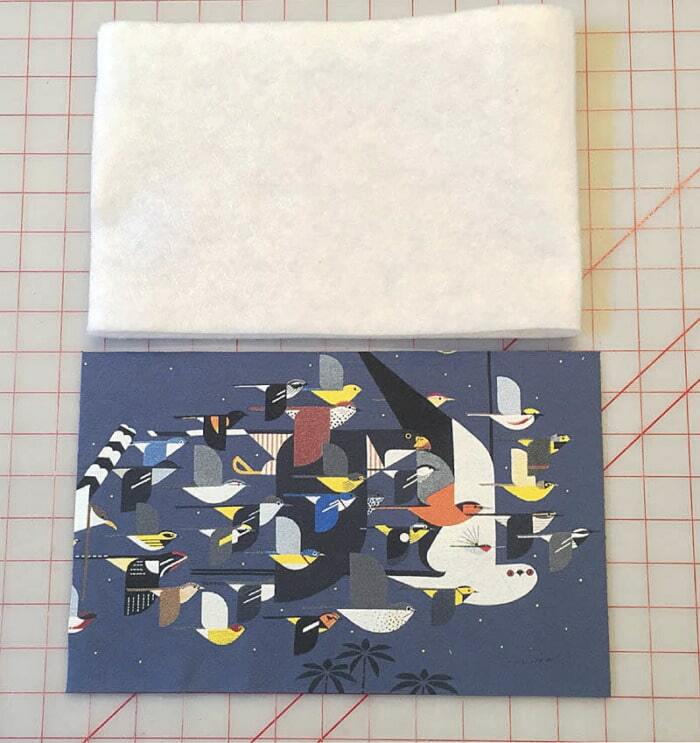 I used my new Press Perfect Hot Ruler from Clover (item 7811) to measure, fold and press 1/4″ on the artwork panel in one step. The grippy surface helped hold and control the t-shirt fabric. 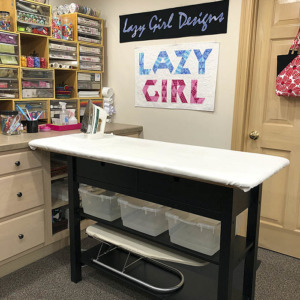 I used several of my Press Perfect tools from Clover on this project. That’s my Hold-It Precision Stiletto holding the fold, and my Iron Safe on the iron soleplate protecting the fabric and t-shirt design. 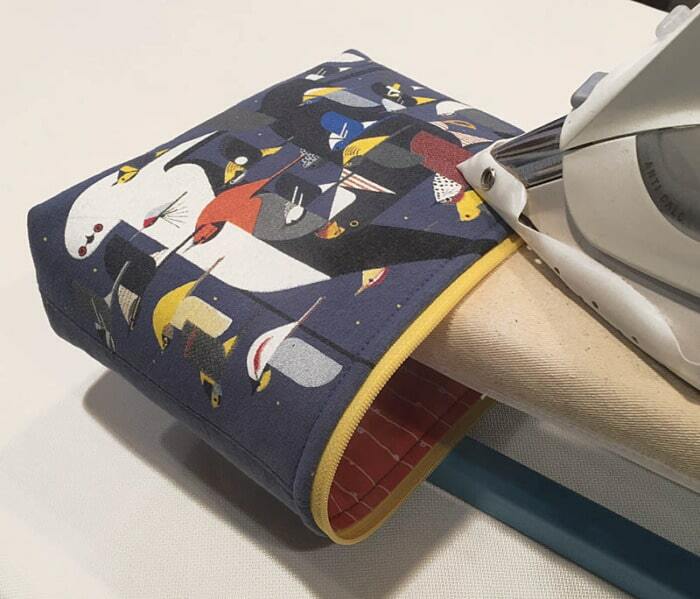 Without the Iron Safe, use a press cloth to protect the t-shirt artwork when pressing. After preparing the panel edge with a fold, I fused both panels to the fleece, overlapping at the center. With both panels fused in place, they were secure and stable for sewing. I topstitched close to the fold, through all layers. 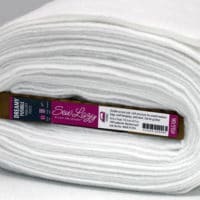 The ‘seam’ is soft with only one line of stitching and no interfacing. The topstitching is a nice detail. 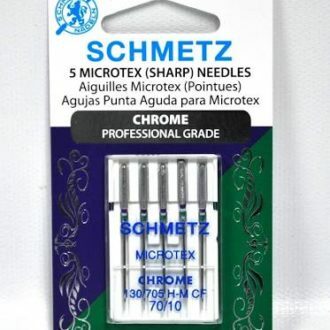 To topstitch, I lengthen my stitch to 3.0 and use an Aurifil 40wt thread. 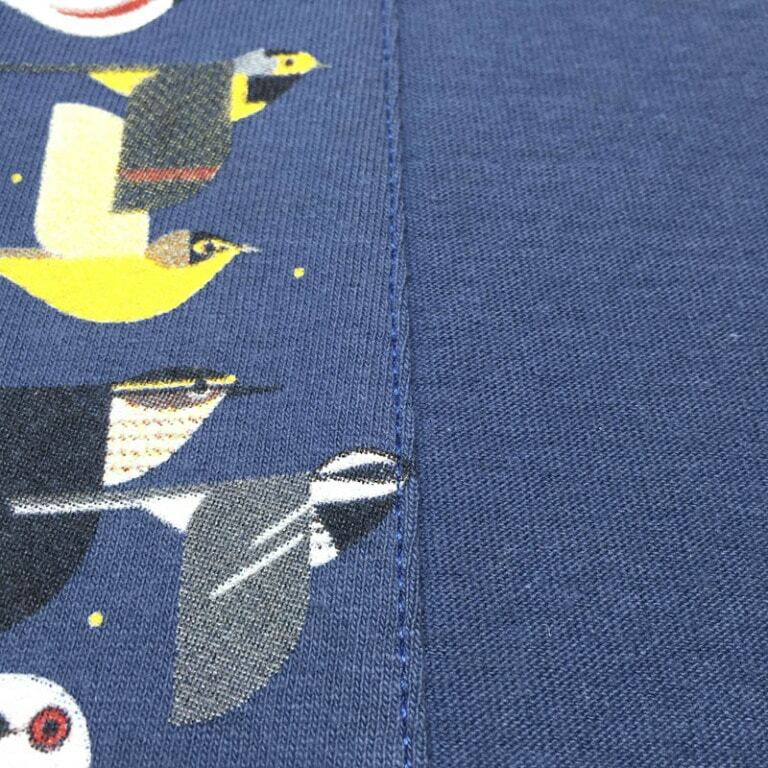 I did stitch through a bird’s beak – sorry about that little guy. Your nose is a small sacrifice for my project. Arrange your options to resemble the finished project. Yellow and orange zippers look great. I like what the yellow does for the little birdies. I love the depth the orange brings to this party. 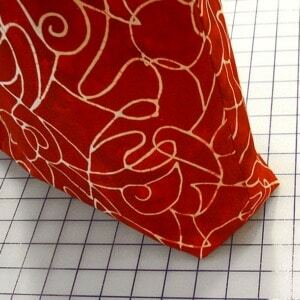 Seeing how great the orange looks made me decide to use an orange fabric for the lining. I like these colors together. Using the yellow zip makes yellow an accent in this color scheme. Yellow fabric for the lining would have been overwhelming for me. But all of that orange-y goodness on the lining is a welcome, hearty anchor for this color combo. When Becca is unzipped, you’ll be able to see the lining fabric. 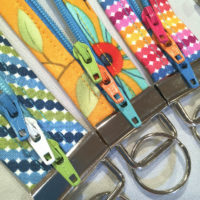 To audition zipper pulls for Becca, be sure to arrange the project and options so you can see all of these elements together. 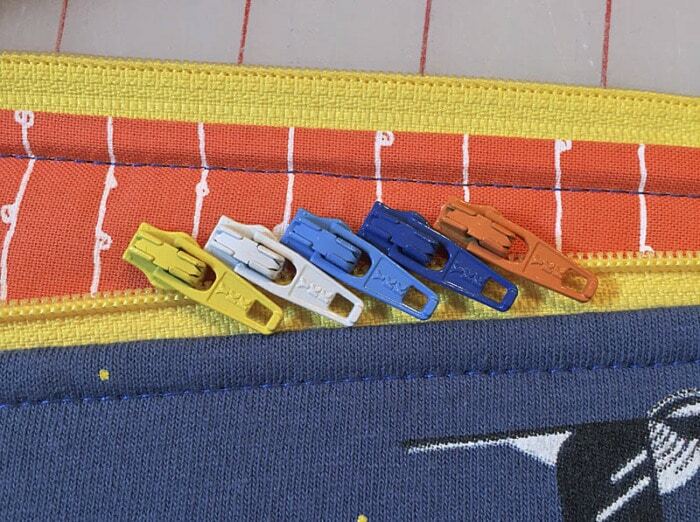 These are all fun options, but I loved the contrast of the dark blue on the yellow zip, against the orange lining. 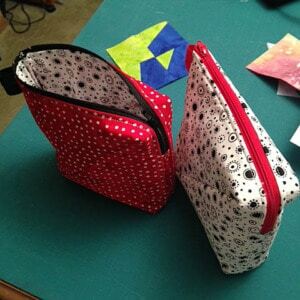 Zips and pulls available from Zipit on Etsy. 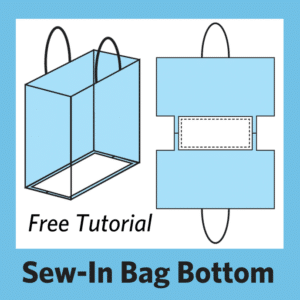 Directions for the zipper installation and how to easily put the zipper pull on are included in the Becca Bags (LGD136) pattern. After construction is done, remember to press. A final pressing elevates your project with a nice finish. Here I’m using my Press Perfect 2×4 Mighty Mini Board from Clover. And here she is, our t-shirt Becca. I love how this turned out using an unconventional material. 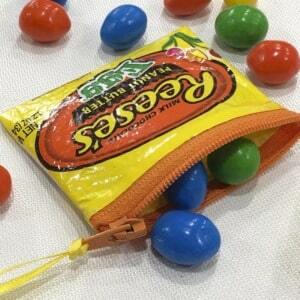 You might also like this License Plate Zipper Pouch Tutorial post. Are you itching to try something new? What will you up-cycle to make a Becca Bag? Please like and share this post with a friend! What a fabulous bag Joan! 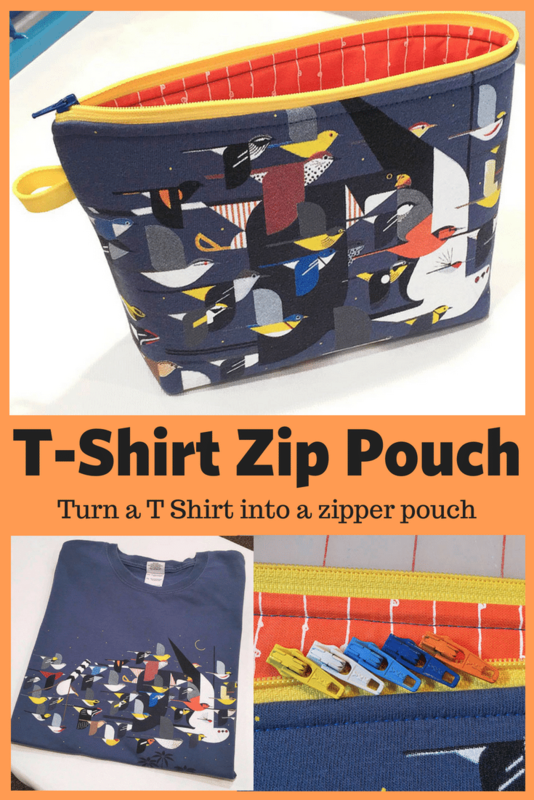 I have made lots of tee shirt quilts without interfacing…its just seeing with knit after all…but adding the fleece is a great idea for this cute bag. Thanks for another great tutorial. 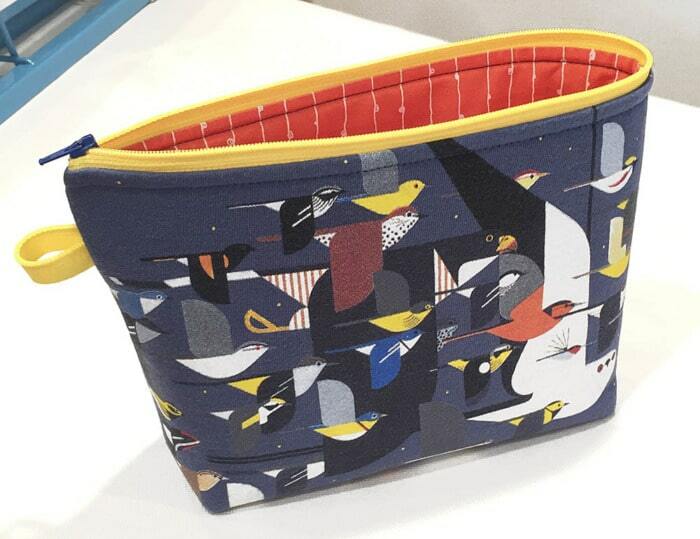 Love your Charley Harper bag!!! 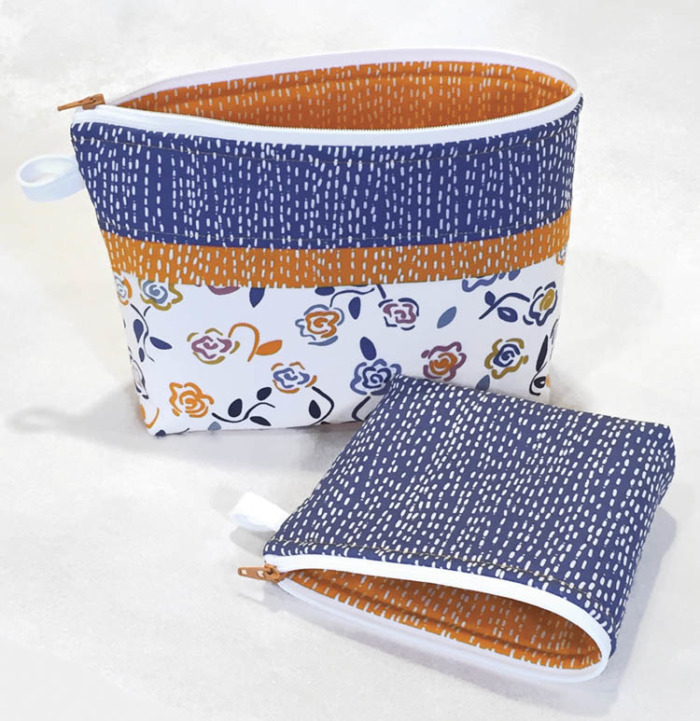 Your Craftsy class is one of my favorites so when I saw your Becca Bag pattern I had to order it…so far I’ve made two small and one large and plan on making more for gifts (once my zipper pull order arrives)…what a fun design!!! I have several tees from various special places that are no longer wearable (too small, hole…) and I’ve been hanging onto them because I just hated to toss them. This is a great idea for keeping them useful. Thanks for sharing. 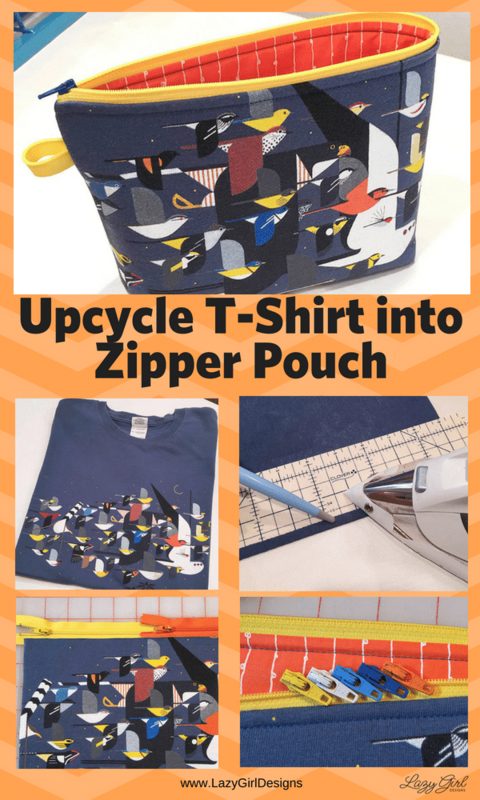 I really love this use of an old t-shirt! I have a few I just can’t part with, but don’t want to put them into a t-shirt quilt…I will be doing this instead! I love your Sweet pea pods and Becca bags. I’ve probably made nearly two dozen of the former and half that many of the latter, and have had a blast doing it. Those Atkinson zipper pulls work great for YKK zippers and will slide fine on Coats zippers but I can’t make them actually close those zippers. Now I have a whole lot of Coats zippers without pulls that work. Any suggestions? Thank you! 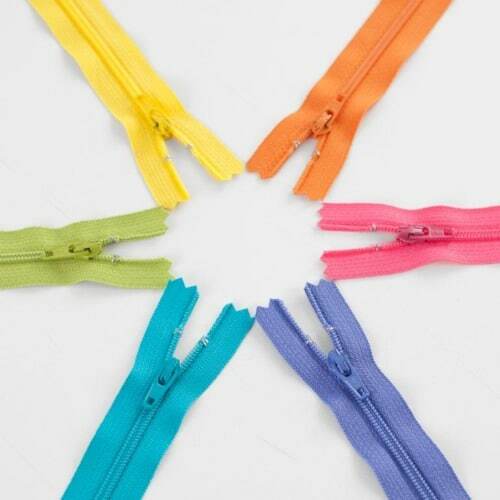 Where do I buy the YKK zippers and zipper pulls.